There’s nothing quite like making your way through some of the most beautiful natural wonders our planet has to offer on foot – light, nimble, and truly one with nature. If you’re an avid hiker, you may want to plan your next trip around these amazing adventures. Some are multi-day treks, suitable for a longer holiday, while others simply end in incredible views. In our opinion, these are the best hikes in the world. It wouldn’t be a list of hikes without this Natural Wonder. The Grand Canyon has a number of truly amazing hikes to allow you to experience the canyon in all of its glory. For day hikers, take a walk on the Rim Trail, which extends thirteen miles from the Grand Canyon Village to the Hermits Rest viewpoint. Luckily, the Grand Canyon offers a shuttle bus to take you back to the Village after your trek. If you are looking for an overnight or multi-day hike, you can contact the Backcountry Information Center to get a permit to camp within the Grand Canyon. You can hike from rim to rim, crossing through Phantom Ranch over the Colorado River, or simply hike down Bright Angel Trail, camp at the base, and head back up. This 26 mile journey deposits lucky hikers at Machu Picchu, the “Lost City of the Incas.” It is a four-day hike with many changes in scenery along the way. It has become a world-renowned hike, with visitors from all over the world heading to Peru to take the journey. Trek permits are necessary to complete the hike, but you can join up with guided tours or group services to ensure you are always hiking with someone! For the true adventurers, this is the ideal multi-day trek. This hike encompasses 112 miles over 10 days around Mont Blanc, the highest peak in Western Europe. Throughout the Tour, you will pass through three countries- France, Italy, and Switzerland. You will see more of the natural landscape of these countries than you ever could in a traditional vacation or guided bus tour. If you take a guided tour of the hike, you will be able to enjoy the hospitality of local villages to rest your head at night. Otherwise, enjoy the beautiful clear skies when you camp along the trail at night. If you are looking to step away from the fast-paced fabric of modern suburbia and back into a more organic way of life, the Appalachian Trail may be your saving grace. With a total length of 2,190 miles stretching through 14 states, it can take up to 7 months to complete from start to finish. Hikers need to be serious about their adventure to attempt to complete the entire thru-hike, as they will need to stop and resupply at certain points and be willing to step away from reality for more than half a year. For those who finish, however, the sense of accomplishment and community with other 2000-milers is worth the mileage. If you aren’t ready to commit 6 months to this undertaking, you can “section hike” the trail, in a serious of multi-day hikes over the course of several years. Those who complete the full Appalachian trail through section hiking are still considered 2000-milers at the finish line. This is a 5-day, 50 mile hike that travels through the most famous trail in all of Iceland, known as the Laugavegur. You will start the journey at natural hot springs, and then trek through gorgeous highlands, with views of mountains, geysers, glaciers, rivers, and more. The hike finishes in a gorgeous valley at the base of Eyjafjallajökull, the glacier that erupted in 2010. Throughout the hike you will stay in adorable mountain huts with views of the landscape, sharing space with your fellow travelers. All of this stunning scenery and variety make the Laugavegur truly one of the best hikes in the world. Africa’s highest peak, and the tallest free-standing peak in the world, is still a popular hike for adventurers from around the globe. Topping off at 19,340 feet, the mountain is also ideal for avid rock climbers. The eight-day hike takes you up the western side of the mountain, and you will have views of a landscape only a select few will ever get to see. If you take a guided tour, locals and experts will be able to tell you all about the plant and wildlife you see along the way. While many of these hikes feature views of lush, green valleys and snow-capped peaks, this 5-day, 40-mile trek is in the heart of the Middle East, with views of sandstone buttes and gravel valleys. The climax of the trip, the ancient city of Petra, is only 100 miles from Jerusalem and is a popular tourist destination. The hike, however, is a gorgeous multi-day trip that allows adventurers to walk the path of an ancient caravan route from the Dana Biosphere Preserve to Petra, with views of the landscape and ancient ruins along the way. 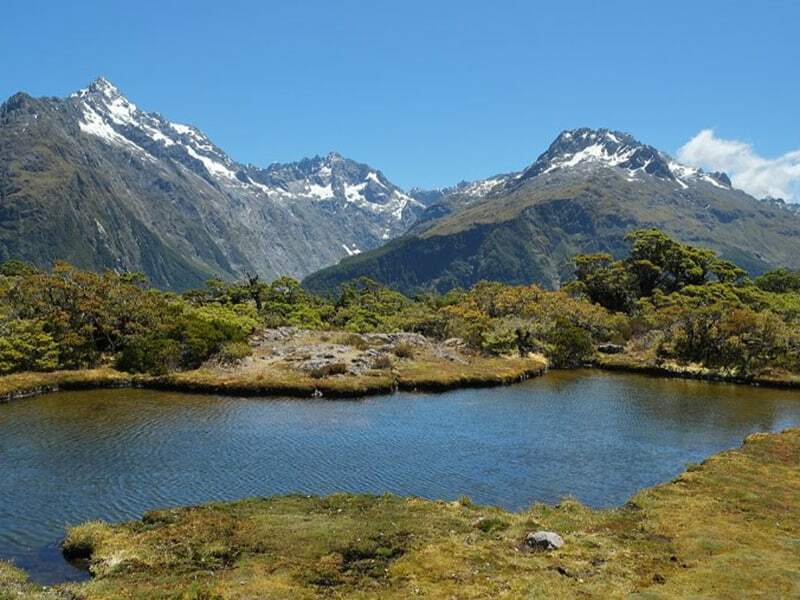 One of the shorter multi-day hikes on this list, the Routeburn takes only 3 days to complete, but it isn’t short on views or beauty. With gorgeous mountains, valleys, and waterfalls dotting the landscape, there is no shortage of something to look at. The landscape was shaped by glaciers thousands of years ago, and the result was a gorgeous varied landscape full of surprises. 4 huts and 2 campsites are placed along the trail for hikers to rest their heads at night, but be sure to book in advance- the trail is popular amongst travelers. This hike tops the bucket list of most avid adventurers, as even simply reaching the base camp is a feat many don’t accomplish. The base camp rests at 17,590 feet, no easy feat for the average hiker. It is not an easy hike, as it experiences quite an elevation gain and can get quite cold as the elevation increases. However, since it is such a popular hike, you can find guided tours and expeditions from all over the world that will help you hike and prepare for your journey. They will provide knowledgeable guides, as well as take the group to historical places you may have missed on your own. Similar to the Appalachian Trail, this exceedingly long trail can take up to six months to complete. With a total distance of 2,650 miles, thru-hikers are dedicated and experienced. You can walk the trail one of two ways- northbound or southbound. Since the trail stretches through mountainy regions that are often covered in snow, be sure to plan your trip according to how the weather will be when you arrive at your final destination. Northbounders usually start in April, while Southbounders can wait and start closer to July. Similar also to the Appalachian trail, you can split the monster hike up into bite-size portions with several multi-day hikes spread out over a few years. This 14-mile round-trip hike is a favorite for local adventurers and visitors alike. The Half-Dome is a Yosemite treasure, and the trail is perfectly challenging. You will get amazing views of the Yosemite valley as you gain elevation up to 4,800 feet. The most famous part of the hike Is the dome itself, where your hike is assisted by two metal cables for the last 400 feet. While you don’t need a guide for the hike, you do need to get a permit as the National Park Service does restrict the amount of hikers allowed on the trail every day. Experience a rarely-seen coastline of the island of Kauai in Hawaii with this 11-mile trail. It stretches along the Na Pali Coast from the Ke’e Beach to the Kalalau Valley. It is one of the most beautiful and one of the most dangerous hikes in the world, as it is a narrow trail that goes over streams and through beachside waterfalls. It can be slippery during inclement weather, and hikers have noted falling rock from the cliff sides above. Hikers will want to acquire a camping permit to stay the night on Kalalau Beach at the end of the hike. Enjoy the magnificent wilderness of Tasmania in this six-day, 40-mile hike through the Cradle Mountain-Lake St Clair National Park. Hikers from all over the world travel to make the trek, and many add side-hikes to the journey, choosing to walk along Lake St Clair or to summit Cradle Mountain along the way. During peak season, the Parks and Wildlife service requires permits from hikers, and they must travel North to South. During the off-season, however, visitors do not need to purchase a permit and may hike whichever direction they choose. This unmarked backcountry route is a 5-day hike through rugged terrain along the Long Range Mountains. Five campsites sit along the trail for packing up at night and making sure you are still along the proper trail. Since it is an unmarked trail, hikers will need to bring a map and compass to ensure they don’t lose their way, as the trail is dotted with streams and caribou paths. You do not need a guide for this hike, though you need to register in advance and attend a park orientation before you begin. This 470 mile trail is another long one, running from Kirk Yetholm up to Cape Wrath on the northern coast of Scotland. It is an “unofficial” trail, linking together a series of official trails to make the longest walking route on the island. Since parts of the trail are official, they are marked and easily followed, while others can be tricky and treacherous with no trail markings whatsoever. As the trail marches northwards, it gets more steep and more difficult. You can go online to see how the trail is broken up and plan your trip according to their 40 individual segments. 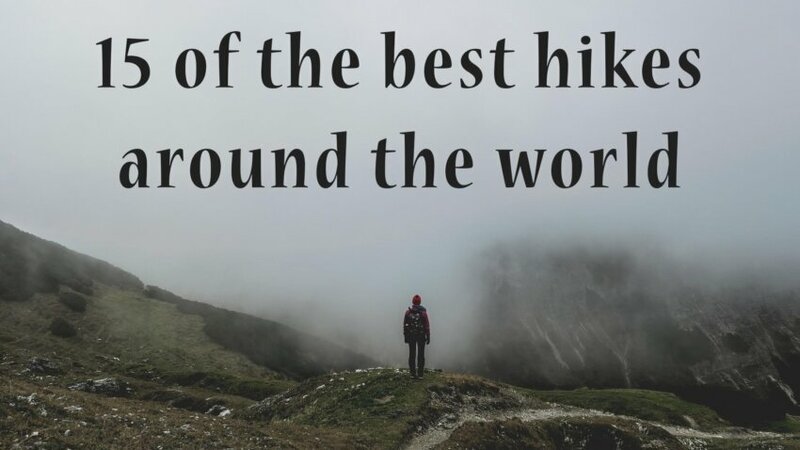 There you have it, the best hikes in the world in no particular order. You can’t go wrong planning a trip to one of the above. Been to any of these world class hikes? Let us know your experience in the comments! Thanks for the heads up Rena. Fixed!